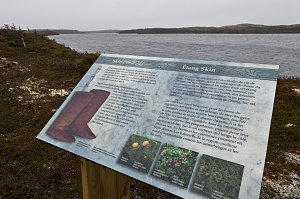 Note: This page describes, in detail (and with lots of extra pictures), our short dayhike along the Birchy Nuddick trail at L'Anse aux Meadows National Historic Site in Newfoundland. This hike was part of our 2-week "Overland to the Rock" Newfoundland Trip. 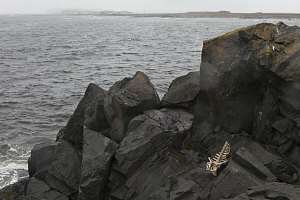 If you came to this page looking for the general narrative for that trip, then you have come to the wrong place. You should go here instead. 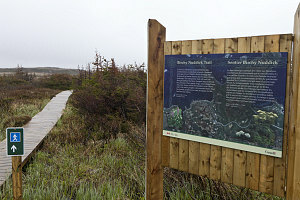 The Birchy Nuddick trail is a short (less than 3 kilometres) mostly flat trail in L'Anse aux Meadows National Historic Site on the tip of the Great Northern Peninsula of Newfoundland. 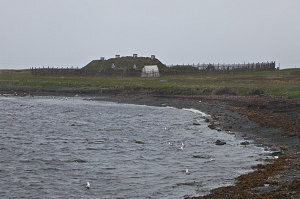 It is a UNESCO world heritage site, preserving and documenting the earliest verified evidence of visitation in North America by Europeans (the Vikings), and the only verified spot where Vikings lived in North America. 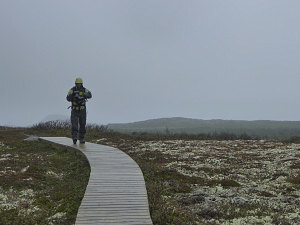 The trail is not specifically about Vikings. 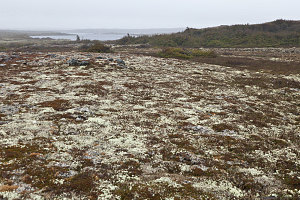 It is more about exploring the unique coastal tundra terrain that prevails at L'Anse aux Meadows. The trail starts from a corner of the main parking lot. 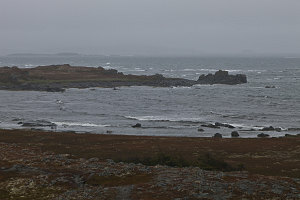 It was a very blustery, cold, windy and rainy day when we did the Birchy Nuddick trail (late June of 2011). 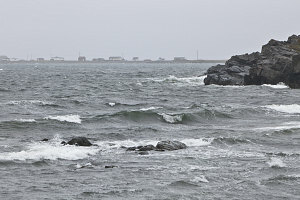 The temperature was only in the single digits, and we had all of our wet and cold weather gear on to prevent getting too cold. 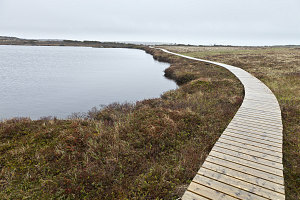 The trail started off on well-maintained boardwalk, crossing the low matted plants of tundra and occasionally through a patch of low scrub. 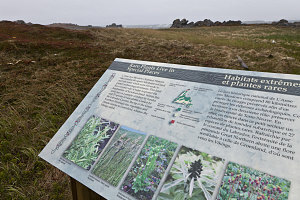 There were several interpretive plaques along the way, describing the nature of the land or of the uses of it by early inhabitants. 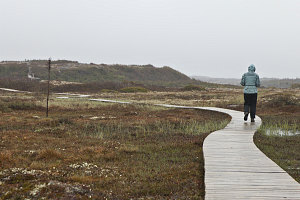 The trail curved around, and eventually arrived at the coast, where the boardwalk sections [mostly] ended. 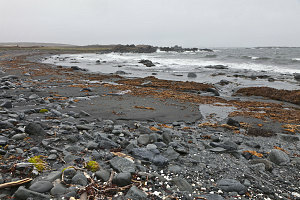 The trail led rightward along the coast, back towards the L'Anse aux Meadows archaeological site, briefly climbing into a slightly more rugged section of coastline with some minor cliffs. 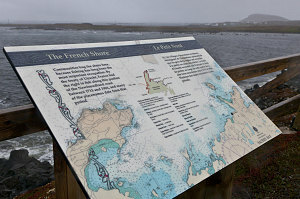 A plaque in this section described the era of usage of the northern coast of Newfoundland by the French, which led to many of the french-sounding place-names in the region. 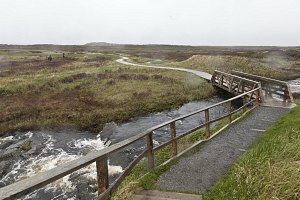 The section of coastline trail soon led back to the main archeaological area at L'Anse aux Meadows, where it rejoined the main access pathway. 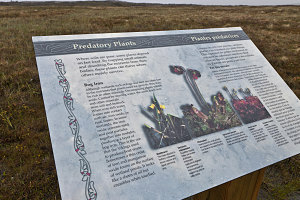 After completing the Birchy Nuddick trail, we chose to explore the archeaological site and sod house re-creations, but you could just as easily skip that and walk the five-minute walk back to the visitor center directly from this end of the trail. 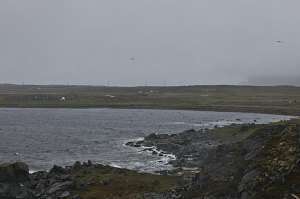 Overall, a nice (not spectacular, but nice) and quite easy trail. Note: If you want to return to the main narrative at the point where this hike ended and our road trip continued, then please click here.